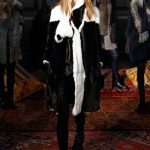 This collection is a bit younger, so people will want to wear the pieces on the street and not just for evening events,â€ said von Schacky. 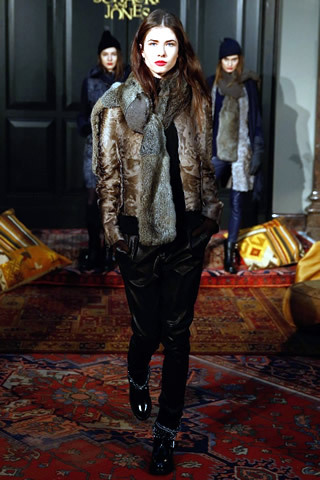 Claudia von Schacky’s Schacky and Jones presentation mixed the label’s trademark opulent furs with skinny leather pants, biker boots and bobble hats in an attempt to appeal to the under-30 set. “This collection is a bit younger, so people will want to wear the pieces on the street and not just for evening events,” said von Schacky. 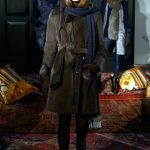 Versatility was key: A reversible trenchcoat was done in lambskin on one side and chocolate brown mink on the other, while a grayish-purple Tibetan lamb fur jacket was paired with leather drawstring shorts for a less formal look.